With the cooler fall temperatures here, it is time to shift our focus to pumpkins, squash, apples and more. For foodies, the best way to really enjoy the fall bounty is to start by roasting these autumn wonders. Even if you do not think you will like these fall vegetables, do not fret. I did not like them either…that is, not until I learned how to turn them into foodie approved dishes. While peaches are on their way out this season, I was able to find some end of the season peaches. Peaches are very simple to roast (especially if they’re starting to go bad). Preheat oven to 400 degrees. Cut peaches into eighths. Place on a baking sheet. Place the tray into the oven and roast for 30 minutes. 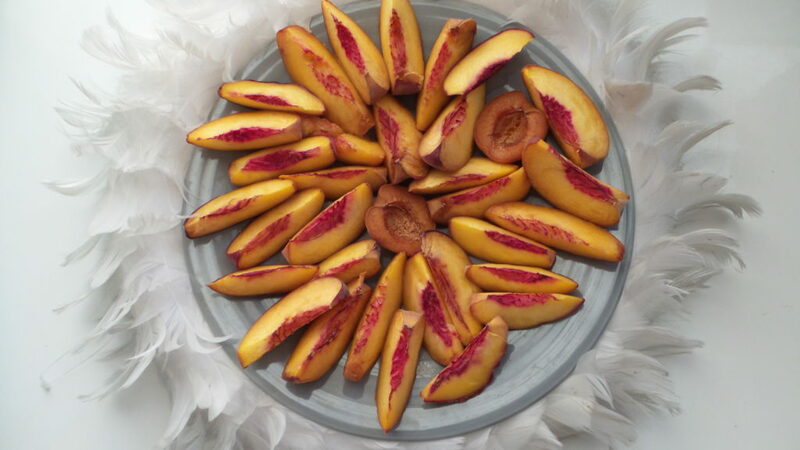 You can roast most stone fruits in the same manner, including apricots. No extra seasoning needed. The roasting helps bring out the flavors in the fruit. Try roasted peaches with pork chops, on top of salads, or drenched in a bowl of almond milk (Matthew Lucifer’s favorite). Probably one of the most annoying things about pumpkins, butternut squash and most of the fall harvest is the amount of work that goes into preparing the vegetable for consumption. For those wanting to buy pumpkins to eat, I recommend buying the smaller pumpkins (less work and easier to manage). For those buying pumpkins for jack-o-lanterns, I also have a few tips on what to do with the pumpkin guts. What you’ll need: cutting board, good knife, 2 baking sheets, and a bowl. If you are going to make the soup and curry below, instead of a bowl, use the crockpot. Cut into the pumpkin, sectioning off a wedge at a time. Remove the guts and place it in the bowl, place the seeds on one of the baking sheets. Remove the skin by cutting the skin off from the meat using your knife. Cut the pumpkin meat into bite sized pieces (similar to the photo above) and place on the other baking sheet. After you have separated up the entire pumpkin, sprinkle sea salt on the pumpkin seeds. For the pumpkin meat, make sure that all pieces are flat on the baking sheet. Drizzle olive oil over the pieces and sprinkle salt and pepper on top. Put both trays into the oven. Bake the pumpkin seeds for 8-10 minutes and then remove from the oven. Bake the pumpkin meat for 20-25 minutes. Remove from the oven. 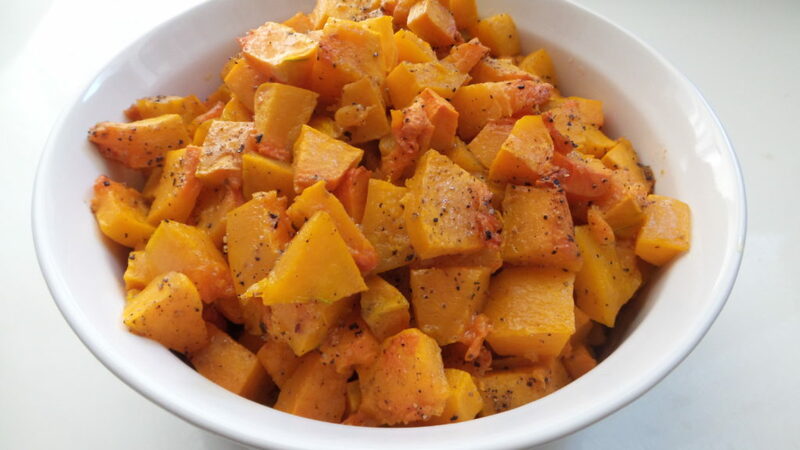 The roasted pumpkin serves as the base for multiple recipes. 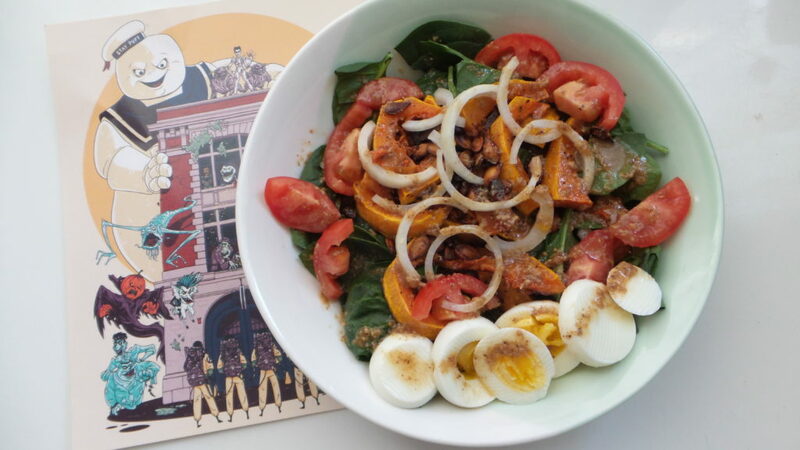 You can use the roasted pumpkin on top of salads (one of my favorite things to do), and use them in a soup. So here is what you should have now: a tray of roasted pumpkin meat, a tray of pumpkin seeds and a bowl or crockpot full of pumpkin guts. 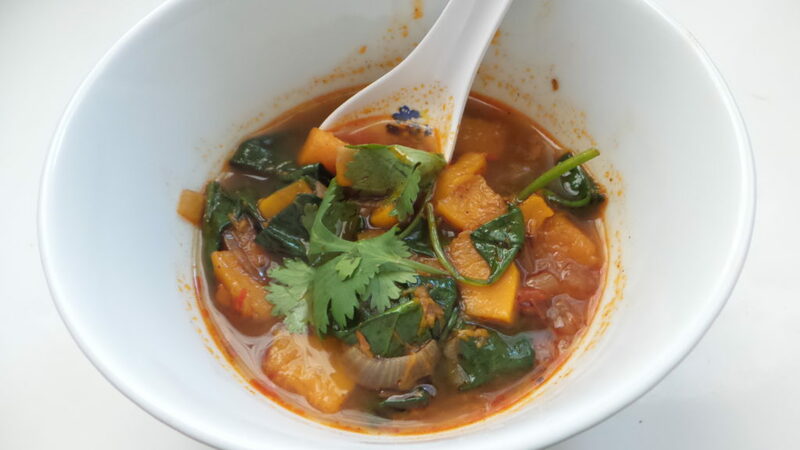 Here’s why we kept the guts…it’s for the Crockpot Thai Butternut Squash (or Pumpkin) curry. 1-2 tablespoons red curry paste The amount of curry paste you will use is based on how spicy you want the curry. In the crockpot, place the pumpkin guts, chicken, kaffir lime leaves and butternut squash. Pour the coconut milk over the ingredients in the crock pot. In a small pot, bring the water to boil with the bullion cube. Add in the curry paste. Stir until the curry paste and bullion cube have completely dissolved. Remove from the heat and add the broth to the crockpot. Turn on high and cook for 4-6 hours (until chicken is soft and falling off the bone). When the chicken is falling off the bone, add the frozen green beans and cook for another 30 minutes. Serve curry with rice, zucchini noodles, baked potato, or eat on its own. Add some cilantro as a finishing touch. Note that I didn’t have you use the entire butternut squash. 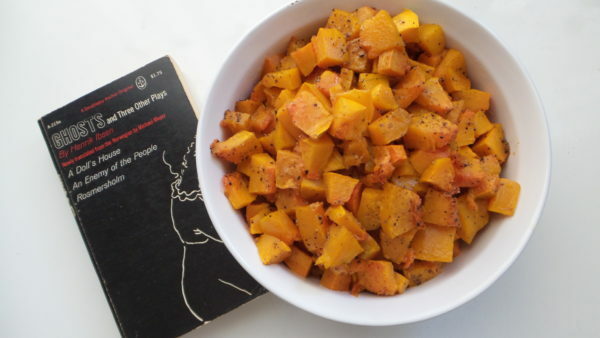 Cut up the leftover butternut squash and roast it the same way you roasted the pumpkin. It’s really tasty on top of salads. Now, there’s a soup recipe, you have to try. Roasted Pumpkin Soup with Harissa and Chickpeas from Real Simple. Since I’ve switched to a more paleo/Whole 30 lifestyle, I could not add the chickpeas to the recipe, so I substituted it with fresh spinach. The result? I got an “OMG, this is so flavorful!” from my test subject. I am a believer in using as much of your food as you possibly can. With the pumpkin and butternut squash, it was easier to make all of the recipes at the exact same time. While the pumpkin and the seeds were roasting, I got the curry ready. After the roasted pumpkin was ready, I replaced the tray of pumpkin with the tray of butternut squash. While the squash was roasting, I started on the soup. I did not use all of the roasted pumpkin in the soup recipe. I reserved a lot of it for other recipes, but mainly for salads. The roasting really brings out the flavor and makes everything taste so much better. The hard part is preparing the pumpkin and the butternut squash. Once you taste the result, the hard work was well worth it. Happy autumn, everyone and I hope you enjoy these recipes as much as I did.